We champion academic excellence, foster artistic expression and cultivate the physical, social and emotional well being of our students in a safe and caring learning environment. 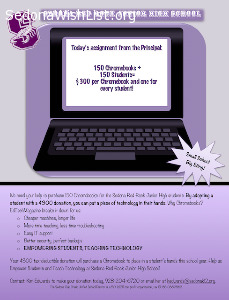 Adopt a Student with a $300 donation for the purchase of a Chromebook. $300 = 1 Chromebook for 1 Junior High Student. Our goal is 150 Chromebooks!